Sign me up for this one! 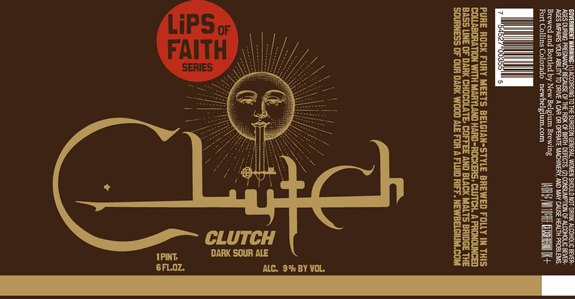 The new release in the Lips of Faith series from New Belgium brewing sounds awesome. It’s called “Clutch” and is named after a hard-rock band out of Maryland. The beer has trickled into some markets on draft already, but the official release party was scheduled for today (August 29th) with the band in Washington, DC. That party looks to have been postponed indefinitely (I’m assuming due to Hurricane Irene). I had been holding on to this post in order to get some information from the party but since that isn’t going to happen….Look for the bottles in your area soon. Pure rock fury meets Belgian-style brewed folly in this collaboration with Maryland hard-rockers, Clutch. A pronounced bass line of dark chocolate, coffee and black malts bridge the sourness of our dark wood ale for a fluid riff. One thing I wonder….Is teaming up with a band to release a beer the new Brewery 1 and Brewery 2 collaboration? Apparently a few bottles were floating around when I was at HopUnion last week but I didn’t hear about it until yesterday. Saw a bunch of La Folie though… wish I could have sampled this one. Any of the new Anchorage Brewing Company beers (distributed by Shelton Bros.) make it down your way? You going to GABF? Hey Chaz- I havent seen any of the Anchorage beers down this way. The distributor that has the rights to the Shelton Brothers portfolio doesn’t do a very good job with it. They are more into distributing wines and liquor. Doubtful I will be at GABF this year, seems like I am on the every other year track! You going this year? Yeah, I’ll be there. Figured I could swing a bottle of the ABC beers your way if you were.